Instrumentation for food quality assurance; Instrumental measurements and sensory parameters. Part 1 In-line measurement for control of food-processing operations: Principles of colour measurement for food; Colour measurement of foods by colour reflectance; Sorting by colour; Food compositional analysis using near infrared absorption technology; Practical aspects of infrared remote thermometry; In-line and off-line FTIR measurements; Microwave measurements of product variables; Pressure and temperature measurement in food process control; Level and flow measurement in food process control; Ultrasonic instrumentation; Ultrasound propagation in foods and ambient gases: Principles and applications; In-line and on-line rheology measurement. Part 2 Instrumental techniques in the quality control laboratory: Rheological measurements of foods; Water activity and its measurement in food; Conductance/impedance techniques for microbial assay; Modern methods of texture measurement. Part 3 Chemosensors, biosensors, immunosensors, electronic noses and tongues: Sensors for food flavour and freshness: Electronic noses, tongues and testers; Chemosensors, biosensors and immunosensors and DNA probes: The base devices; Biosensors for process monitoring and quality assurance; Commercial devices based on biosensors; New biosensors. The first edition of this book quickly established itself as the standard reference in its field, and the second edition consolidates this reputation. Keeping up with the rapid change in this area, there are 16 new contributors and 8 completely new chapters, as well as major revisions to existing chapters, making this second edition a substantially longer book. 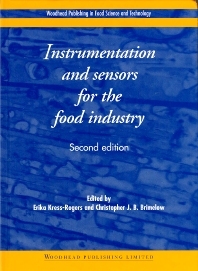 Instrumentation and sensors for the food industry 2nd edition begins with two introductory chapters to set the scene, part one covers in-line measurement of food processing operations, including colour measurement, the measurement of food composition by a range of techniques, and the measurement of pressure, temperature, level, flow and viscosity. Part two reviews instrumental techniques in the quality control laboratory, including the measurement of rheological properties, texture, water and microbiological activity. Part thee has five chapters devoted to the increasingly widespread use of electronic noses, chemosensors, biosensors, immunosensors and DNA probes. Dr Erika Kress-Rogers is a former Principal Scientist at Leatherhead Food Research Association. She now works for ALSTOM. Dr Kress-Rogers is also the editor of Handbook of Biosensors and Electronic Noses: Medicine, Food and the Environment (CRC Press Inc. 1997). Christopher Brimelow is Head of Nestlé R&D Centre Shanghai Ltd. He has extensive experience in the on-line and off-line measurement of compositional and physical properties of food materials, including water, protein and lipid contents, water activity, bulk density and colour.